Rewarded Video Ads have been a constant, dominating trend in free to play over the last few years. Starting with companies like Ketchapp and Futureplay, it became abundantly clear that games can drive meaningful revenue from video advertisements, and advertisers can find captive audience in mobile players. In the last couple years, Video Ads have reached a tipping point. No longer seen as superficial revenue on top of IAP revenue, designing for video ad revenue has become the dominant revenue growth area for free to play companies. Designing for video ads has allowed for innovation in the maturing mobile space that is much needed. The rise of hyper casual is exciting because it goes counter to what traditional free to play games have been moving towards massive budgets, multi-year long productions that are getting riskier and riskier. Hyper casual games are innovative, quick to make, and easy to market when done right. Gram Games is one of many that successfully capitalized on the hyper-casual trend. Games like 1010! And Merged were quick to make, yet clearly, generate more than enough revenue to support the mid-sized Turkey-based studio (now with an additional studio in London). Gram Games most recent launch is “Merge Towns”, a mash-up of a puzzle and an idle game. The game has peaked at #3 top free downloads in the UK, and is within the top 20 downloads in the US. This game clearly shows the latest innovation in the video-ad driven monetization space and is an excellent guide for newcomers to space. Not only does it have strong proven video ad integration, it also supports a innovative core gameplay. Let’s take a closer look. You can see above how the core is built. You can drag and drop any piece on top of another piece of its kind. There are no restrictions like Triple Town or Threes. Placing the same tier of piece (a small house) on top of the same tier will upgrade the house to the next tier (a piece with 2 houses). This carries forward and forward throughout the game, creating more and more intricate pieces. The first step is about generating pieces. Players can do this by rapidly tapping on a button, or by waiting. With the generated pieces, players combine them to upgrade them and make space for more land and new pieces to fall. With the upgraded buildings, these generate faster soft currency. Overall the gameplay feels significantly more approachable and casual than Threes or Triple Town. For Triple Town, the restrictions on movement and the loss condition make for a far more difficult puzzling experience. Merge Towns feels much more like a new take on an idle game mechanic (ex. Farm Away and Build Away’s core gameplay). Instead of simply asking players to tap-tap-tap their way to progress, they’ve added a thinly more involved matching mechanic which feels satisfying to complete. What this says to me is that the key part that works for the Idle genre is the metagame and the economy. Clicking over and over again is just a relic of the Cow Clicker days -- to innovate in this genre it will be about combining the economy of and idle with interesting core mechanics which have significantly more interest than tapping over and over. Merge Towns executes on this. Merge Towns appeals to a wide casual market while having the lasting economy of an idle. Eventually new tabs open up on the right which introduce the player to new areas of the game. This offers up an entirely separate town to build up. Their soft currency is completely different, so progress in the first zone does not help at all to progress in the second zone. This is a far break from their idle game roots. This design decision has some pros and cons. On the one side, it feels casual because I don’t actually lose any progress -- my initial town is still running and I can still keep upgrading it. All the visual progress that I’ve made upgrading my buildings is still felt. It removes the punishing feeling that most idle games can have. But in essence longer session length is what Gram games want. The longer their sessions -- the more players stay within their game -- the higher their Video Ads watched per DAU. Restricting session length too much actually isn’t in Gram Games favor. So Gram Games made the right design decision, as long as it doesn’t translate into exhausted players. Advertising strategy always revolves around getting the highest possible adoption and driving as many completed video ads viewed per DAU. More on this in a previous article. This integration is great for driving a high adoption. Right from the outset there’s a high adoption integration. Some scarcity + a clear benefit make this easy for a high percentage of your DAU to accept. However because it's limited, it's not great at driving a high quantity of views. 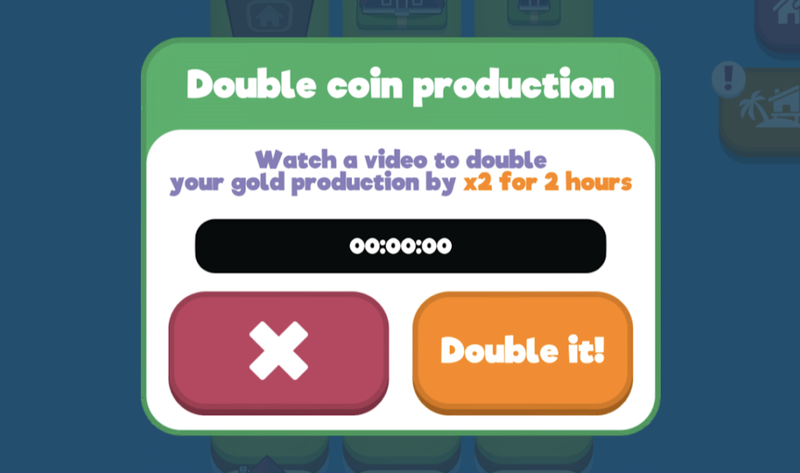 Similar to Build Away and Bit City, Merge Towns gives the player the opportunity to double their overall coin production for an extended period of time for a video ad watch. This drives adoption (it's an incredible deal) but is weak on quantity of video ad views due to its limited nature. This is also more likely for session design over monetization -- giving players a compelling reason to come back to the game every 2 hours. Lastly, Gram Games also has Ads forced upon the player when doing certain actions. When entering the shop (which happens multiple times per session) and sometimes when moving between zones (as you progress this happens more and more) you can be presented with a skippable full-screen ad. They definitely are annoying, especially since they seem to appear randomly (most likely due to fill-rates from advertisers). So Gram Games’ embraces their shorter retention curve by their aggressive ad strategy. While it does no favors for their retention, they made a calculated trade-off between retention and revenue. If you know players aren’t going to be here a long while, retention isn’t king… revenue is.